WORLD welterweight champion boxer Charles Manyuchi is likely to retain the Sportsperson of the Year award which he won last year when the Annual National Sports Award banquet is held tonight in Harare. The award carries a prize money of $5,000 and the Junior Sportsperson of the Year award is sponsored to the tune of $2,500 by Shumba Maheu. Tonight, the Sports Commission will honour the athletes and officials who excelled in different sporting disciplines this year. Manyuchi is likely to win it ahead of swimming icon Kirsty Coventry who also had a good sporting season grabbing three gold medals at the African Games and also booking another place to the 2016 Rio Olympic Games. However, following his conquests in July, which saw him retain his WBC welterweight title after beating Italian opponent Gianculla Frezza in Italy, Manyuchi stands a great chance to defend his award. 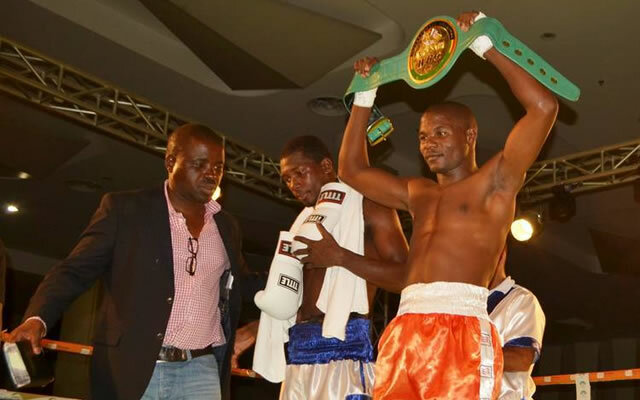 The Mutoko born pugilist was also honoured by President Robert Mugabe at a special banquet at the State House and was rewarded with a whooping $50,000 for raising the country’s flag high. Manyuchi, has also been nominated for the Sportsman of the Year accolade together with karatekas Admire Chingozhoro and Mighty Tangai Mhlanga and might walk to the podium twice tonight. Coventry is also in the mix as she booked a place to the 2016 Rio Olympic Games and claimed gold in the women’s 100m backstroke, 200m backstroke and 200m individual medley events in Congo Brazzaville in September. The Golden Girl, was nominated with two other nominees rower Micheen Thornycroft, who is also bound for the 2016 Rio Games, and female bodybuilder Helen Costa Sinclair in the Sportswoman of the Year award. The Junior Sportsman of the Year award also has strong competition with motorcross duo of Bako Emmanuel, Tanya Muzinda, Drew Michael Williams of triathlon, rower Hinde Kyle, tennis star Bhunu Valeria and swimmer Lee Robyn. The ceremony will also honour the Sports Administrator of the Year, Sports Development of the Year, Women In Sport Award as well as the Special Acknowledgements Awards. Women’s national soccer team, the Mighty Warriors who are also in running for the Glo Caf Team of the Year after they were nominated together with other four countries by the continental body, are also likely to win the award in the Team of the Year category. They have been nominated together with senior netball team and sevens rugby. Mighty Warriors coach Shadreck Mlauzi is also likely to win the Coach of the Year category ahead of Rugby Sevens mentor Daniel Hondo and senior netball coach Ledwin Dondo. The Sports Commission said they are also excited that this year’s event has seen more corporate partners coming in to join traditional sponsor Delta Beverages in sponsoring this year’s awards. Minerva, ZETDC, CBZ Bank, Manolios Sport, E-sport will sponsor some of the 17 awards which are on offer. Sports Commission, Corporate Communications officer Tirivashe Nheweyembwa, said all is set for the biggest ceremony in the country’s sporting calendar. “This is an exciting development for the awards as it indicates the growth and development of the ANSA brand as manifested by the arrival of new sponsors on board. The preparations to host the 21st edition of ANSA are now complete. ‘The event which is set to take place tomorrow at the Rainbow Towers will start at 18.30 hours and the guest of honour is the Minister of Sport and Recreation Makhosini Hlongwane,” said Nheweyembwa.